Wine brand The Vineyard House has filed a lawsuit against Constellation Brands over California’s To Kalon vineyard, as seven different entities now lay claim to ownership of parts of the historic site. To Kalon, which was bought by Henry Walker Crabb in 1868, has long been the centre of legal battles and trademark disputes. This month, another dispute has arisen after Jeremy Nickel, founder of the The Vineyard House wine brand, filed a lawsuit at the US District Court on 18 March. Robert Mondavi Winery in Oakville, owned by Constellation Brands, obtained a trademark for “To Kalon” name in 1988 and “To Kalon Vineyard” in 1994. Seven (including The Vineyard House) different entities now lay claim to ownership of parts of the vineyard, the principal owners, aside from Robert Mondavi, being Opus One and grower Andy Beckstoffer. Crabb initially bought 240 acres of land near Oakville in 1868, with a winery following in 1872. In 1881, he bought a further 119 acres of land next to his original vineyard, with the total area now totalling 359 acres. Disputes have arisen as to whether all of these 359 acres are the To Kalon vineyard, or, as this most recent lawsuit has alleged, a further 165 acres of land on higher ground, which Crabb acquired in the late 1880s and didn’t plant, should also be included. The name To Kalon was first used by Crabb in reference to his winery in 1886. Crabb passed away in 1899. Jeremy Nickel of The Vineyard House is suing Constellation Brands for the cancellation of trademarks and unfair business practices. 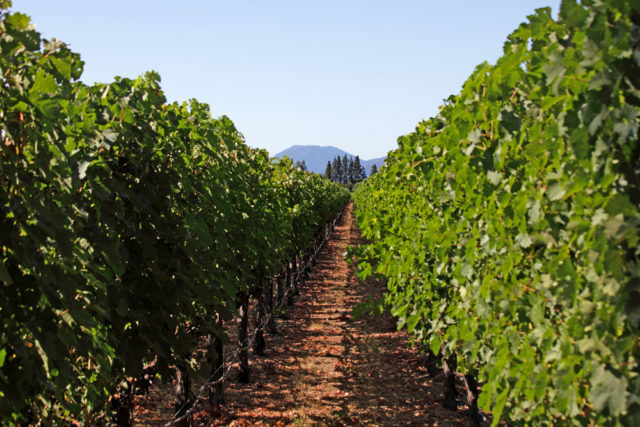 The lawsuit states that Nickel owns 17 acres of a 168-acre parcel of land bought by Crabb in the late 1880s, some 20 years after he bought the original To Kalon vineyard. Constellation owns 188 acres of what Nickel calls the original Crabb vineyard (the 359 acres plus the 165 acres on higher land). The company owns another 361 acres which are not part of the To Kalon property, according to the lawsuit. Because of this, Nickel argues in the court document that Constellations’ To Kalon Vineyard includes land that was not part of the original estate owned by Crabb. He is calling for Constellation’s trademarks to be revoked and is asking to be able to use the To Kalon name on his wines produced under The Vineyard House brand. The lawsuit follows a similar argument put forward by grower Andy Beckstoffer in a lawsuit in 2002. He argued that To Kalon was a place and should therefore not be allowed to be trademarked for marketing purposes. In 2017, Constellation attempted register three more trademarks: To Kalon Wine Company’, ‘To Kalon Vineyard Company’ and ‘Rooted in To Kalon’. The drinks giant later abandoned these applications, instead registering ‘The Miracle of To Kalon’ and ‘To Kalon 1886’ in 2018. Constellation bought Napa Valley Cabernet specialist Schrader cellars for US$60 million in 2017. Schrader, which producers Old Sparky’ Cabernet from the To Kalon vineyard, has neither a winery nor vineyards, instead buying all of its grapes from Andy Beckstoffer. This is a fascinating story. How did the original owner, Henry Crabb, come up with the name To Kalon? There are very few US vineyard names that are reconized by wine lovers; and To Kalon is surely at the top of that list, as is its magical quality reputation. That’s probably the thing that Robert Mondavi missed most in the sale to Constellation Brands. He had that special gift for identifying the most promising vineyard sites.